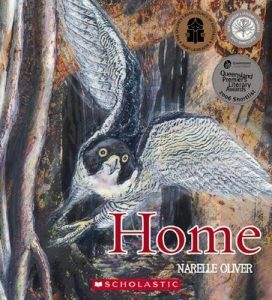 Narelle Oliver is a creator, a world-wind who shared life and our wonderful natural world in incomparable ways. Her picture books of narrative non-fiction are informed and exquisitely constructed, often using her signature hand-coloured linocuts. I had to catch my breath when I recently opened our copy of The Hunt (adapted for the international market as Twilight Hunt). Narelle has featured camouflage and hidden creatures in this and a number of her picture books. In The Hunt I also found the bookplate reminding me that we gave this book to our now 24 year-old teacher son on his fifth birthday. Camouflage also appears in Baby Bilby, where do you sleep? 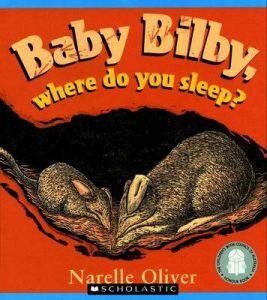 Like many other people, this is the book I always buy for babies but it is so much more than the typical baby book with its age-appropriate information about desert animals and peepholes displaying the animals and their tracks. I remember my first reading of Sand Swimmers: The Secret Life of Australia’s Dead Heart when it was published. The content is original – discovering the unexpected life in the desert alongside the explorations of Charles Sturt but the exceptional multilayered composition is what sets it apart for me. The Best Beak in Boonaroo Bay is a fable about wanting to be the best. It is fascinating that the spoonbill appears here first amongst the birds who compete to have the best beak. Narelle went on to create her award-winning book Don’t let a Spoonbill in the kitchen! which once again features the spoonbill with its wide, swishing beak. Narelle would travel around Australia and further afield running popular workshops for children. She has left a wonderful legacy of other books and collaborations. She also illustrated the cover of UQP’s re-issue of Ruth Park’s children’s classic My Sister Sif in her inimitable mermaid style. 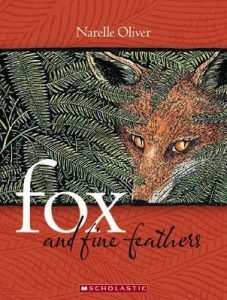 I was privileged to be in conversation with Narelle in a retrospective of her work at the launch of her brilliant Fox and Fine Feathers by Governor-General, Quentin Bryce. Fox was an Honour book in the 2010 CBCA awards. Apart from its evocative, suspenseful story and peerless linocuts, it is distinguished by lyrical writing, panels and frame-breaking. The unconventionally shaped panels when the Nightjar tricks Fox masterfully suggest a jigsaw puzzle. I bought a limited edition hand-coloured print of the Coachwood Forest (a double-page spread in the book), which I love because of the sense that I’m about to walk into the picture and into the forest. When our home was badly flooded in the 2011 Brisbane floods, Narelle offered to replace this artwork but fortunately we had saved it. We have it with us now and, alongside her books, it is a constant reminder of Narelle’s talent, kindness and generosity.